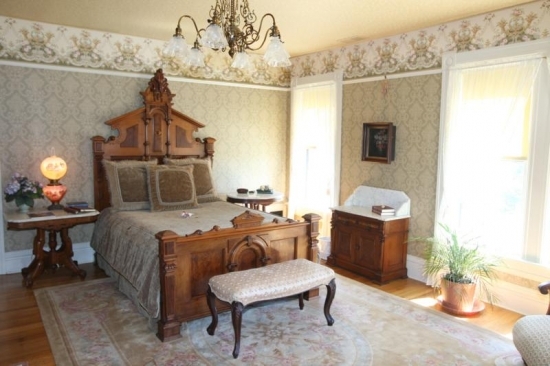 The Dayton Suite's sleeping room is both spacious and grand, with three doors of mirrors on the ceiling-high armoire, plus another antique bureau with its own large mirror. 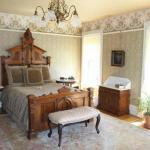 The queen-sized bed, trimmed with elegant head- and foot-boards, is the centerpiece of the room, which is appointed in soothing shades of sage and sand accented with Victorian rose. Let your gaze wander to a full-grown oak tree or the decorative balcony just outside three of the room's four over-sized windows. The light-filled adjoining sitting room is an ideal spot to take advantage of the Historic Dayton House's free WiFi, if you've brought a computer, or to relax with a cup of complimentary coffee (brewed in the room's four-cup coffee maker) while lounging on the couch (which conceals a full-sized, pull-out bed) across from the flat-screen TV. This room, decorated with a feather-patterned Victorian-era wallpaper and a graceful chandelier, has a terrific view of the historic First Lutheran Church and its soaring steeple. Note the decorative, tile-plated corner fireplace, which has a full-length mirror on one side as well as a mantel-top mirror. A round oak table in the sitting room is a great spot for a small card game or for computer work. The full private bathroom is home to a clawfoot soaking tub with bookholder/tray and hand-held shower, plus in-floor heating, a wide pedestal sink and an adjustable thermostat.